Straw-colored body with dark X-, Y- and W-shaped markings on sides. Breeding males are very dark brown with black on head and fin. Total length: 1 1/2 to 2 3/4 inches; maximum about 3 inches. Found primarily in pools and slow-moving riffles in sandy streams. Common in prairie streams of northeastern and central Missouri. Most active in daytime. More tolerant of siltation and turbidity than other darters found in Missouri. More abundant in creeks that in rivers. Unlike many darters, it is more often found in quiet pools than in riffles. Midge larvae, other aquatic insects and small crustaceans. 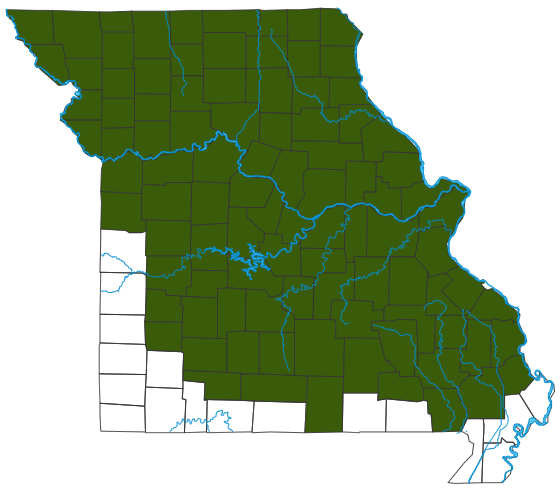 Occur throughout most of the state except lowlands, south-central Ozarks and parts of western prairie areas. One of the most common and widely distributed Missouri darters, occurring over most of the state. It is most abundant in prairie streams of central and northeastern Missouri. Lifespan is about 3 to 4 years. In April and May, this species spawns upside down on the underside of rocks or other submerged objects.